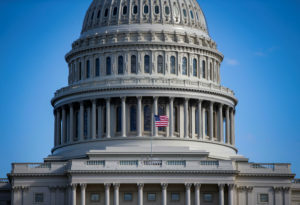 WASHINGTON — Flexing their new majority, Democrats are moving to push through the House a comprehensive elections and ethics reform package they say will reduce the role of big money in politics, ensure fair elections and restore ethics and integrity to Washington. The sweeping, 570-page bill also would make Election Day a holiday for federal workers and require “dark money” political groups to make their donors public. And it would create a public financing system for congressional campaigns that Democrats say will cut down on corruption and reduce the power of lobbyists and other special interests. The sweeping, 570-page bill would make Election Day a holiday for federal workers and require “dark money” political groups to make their donors public. “The public is smart enough to know that where you get your money, that’s where you get your marching orders,” said Rep. John Sarbanes, a Maryland Democrat who is the bill’s main author. This bill allows “everyday Americans to become power brokers” with small contributions of $50 or $75 that will be matched at a 6-to-1 rate by the government, he said. Senate Majority Leader Mitch McConnell has pronounced the measure dead on arrival in the Senate. “This new House Democrat majority’s top priority is apparently assigning themselves an unprecedented level of control over how they get elected to Washington, D.C., along with … what American citizens are allowed to say about it,” said McConnell. Among the flaws in the bill, McConnell said, is that the disclosure requirements for political donations would curb Americans’ First Amendment rights by making their private information public. Fred Wertheimer, president of the advocacy group Democracy 21, called those concerns overstated, saying the bill takes needed steps toward accountability and transparency. Wertheimer called the bill “historic legislation” that would put in place a host of reforms that would begin to “fix a broken political system and a corrupt campaign finance mechanism” that threatens our democracy. “This has an opportunity to become the defining brand of the Democratic Party,” he said. “We are the party that stands for reform. We are the ones fighting to protect democracy and end corruption. That’s a message we can lean on” in 2020. Left: Democrats are moving to push through the House a comprehensive elections and ethics reform package they say will reduce the role of big money in politics, ensure fair elections and restore ethics and integrity to Washington. Photo by Al Drago/REUTERS.